Posted on April 1, 2011 at 08:52. 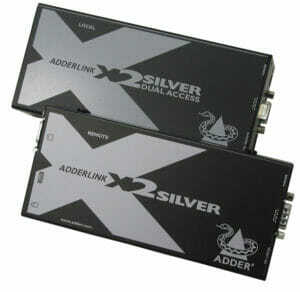 As we have mentioned in other posts, all of the KVM extender models we sell use the Adderlink X2 Silver internal electronics. We package this device in various industrial enclosures, but also sell it stand-alone. This model uses PS2 for the remote keyboard/mouse devices, VGA for video, and Serial RS-232 for the touch screen. It’s no mistake that Serial and PS2 are chosen for pointing devices: these are simple protocols that are very easy to reliably extend over very long distances (up to 300m for this model). 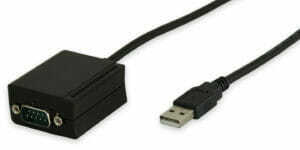 We sell USB adapters for both PS2 and Serial for users who do not have these native connections. Extenders where Mouse/Keyboard Signals are Terminated – with these extenders you can hook up a USB mouse or keyboard, and sometimes a memory stick, but they do NOT support other USB devices. These extenders are generally terminating the USB device signals, extending them, then recreating/simulating the device to the computer. They expect the connected mouse/keyboard to be a standard device. The Elo touch screens we use are NOT standard mouse devices, and will never work with these type extenders. Full USB Extension, but decreased speed – these devices claim to work with all USB devices, but they may drop the signal speed to a lower rate than you get with a straight cable. Elo-equipped touch screens like ours require at least a full-speed USB 1.1 connection. Using this type device, the touch screen may or may not work, or might sporadically work. Full USB Extension, full USB speeds – some KVM extenders support full USB speeds (these may be called “transparent USB”). Generally these models are limited to 30-50m when operating on standard CATx cable. These generally work fine with our touch screens, but we have seen problems with specific models. We have also done confirmation testing on the Adderlink X50, which is a full USB extender. We do not integrate this model because its distance is limited (50m), but we have confirmed that it will work with all touch screens and keyboards that we sell. We often recommend this unit to customers when a full USB extender is needed, and the distance limitation is not a factor. All that said, we will soon be evaluating a newer class of USB KVM extenders that promise transparent full-speed USB operation at distances in the 300m range, while still using standard low-cost CATx cable. If tests go well, look for a fully-integrated USB KVM extender from us at some point in the near future. We have an advanced new class of USB KVM extender which not support all types of USB touchscreen technologies (not limited to Elo, but of cause work with all different types of Elo sensors/controllers). Our USB KVM extender can extend 300Meter of touchscreen and all other USB HID devices with patented USB DDM technologies. If you like, we can arrange to have you guy test it to confirm it. Since it had just released in days, samples are limited. Please email me or spencerb@connectpro.com for the detail. correct the reply: It should be “new class of USB KVM extener which “does” support all types of USB touchscreen technologies.